Is it a cartoon? Is it a puzzle game? The latest release from Ireland's Studio POWWOW does a good job of ticking both boxes. The game looks great from the first screen. The cartoon graphics are crisp and fun; there's even a happy seagull, no doubt taking time off from terrorizing pedestrians. The navigation is nice and clean, with big buttons and clear icons. The first button brings you to a wardrobe function where you can dress-up your characters in different outfits, allowing you to play the game in your chosen style. The rest of the buttons start the game, bring you to the puzzles or play the videos. Puzzles and videos are initially locked and once you start a game that decision makes sense. The game launches into a high quality cartoon, easily at home on The Cartoon Network or any TV set. It was a joy to watch and Studio POWWOW's strong animation background really shines through. Characters are quickly established and although initially odd, the Irish accents ultimately make the game more likeable. The intro cartoon is of such a high quality, it's somewhat jarring to enter the game mode without voice overs. It's an understandable decision, there's enough text for voice acting to add considerable file size and expense to the app, but it still feels odd for the first few minutes of gameplay. The dialogue hits the right note, neither overly simplified or too long. Unlike a lot of modern games aged at younger viewers (Nintendo Wii games are a major culprit,) adults won't find themselves becoming quickly frustrated. 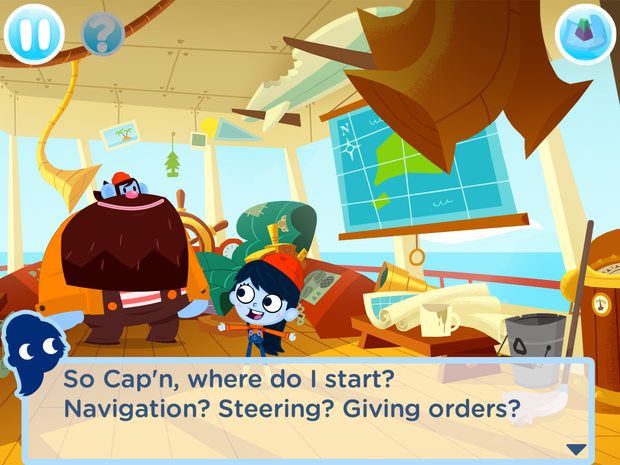 The series of puzzles are carefully planned and quickly escalate, requiring a moment of thought that goes beyond the 'busy-work' approach taken by many touch screen games for kids. Puzzles make good use of the mobile platforms and you really need to break free from a traditional gaming mindset. At one point I found myself embarrassingly stuck, until I realised the puzzle required simultaneous touch input from two hands. If the player is determined, they can finish the game quite quickly, but this is a result of the episodic nature of the ShipAntics games. Think of them less as a series of games and more like a cartoon series that lets you get stuck in. The game is still good value for €1.99 and will provide some replay value for younger gamers. Studio POWWOW have a great first entry here and parents will hope that episode two doesn't jack up the price, because little gamers will definitely be wanting more. Honestly, this not-so-little gamer wants more too. Ronan Price A seemingly deep game with hidden shallows, Donut County builds a short two-hour experience around one clever idea. Give the player a moveable hole that grows bigger as it swallows objects. Ronan Price The journey from game console to touchscreen device is an arduous one. Many developers have come unstuck in trying to translate ideas best suited to a console controller.